Does your bathroom look like a sterile hospital bathroom? I love color and I think looking at colors makes you happy. 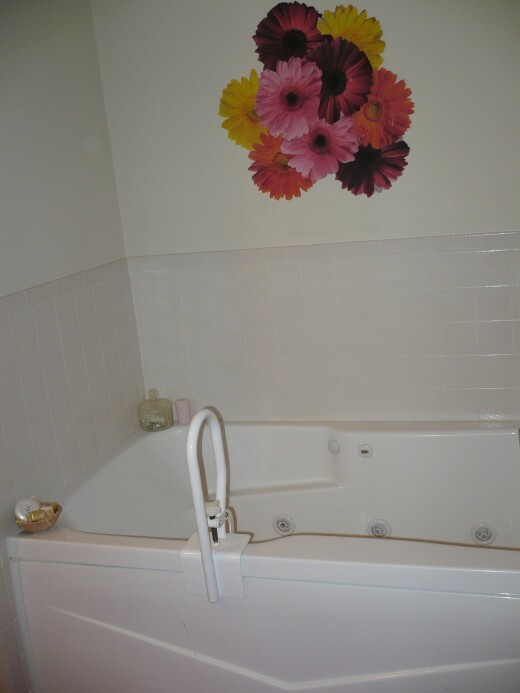 This bathroom décor I will be showing you is very inexpensive and adds a punch of color when you walk into it. You bathroom will go from drab to awesome with these few decorating tips. 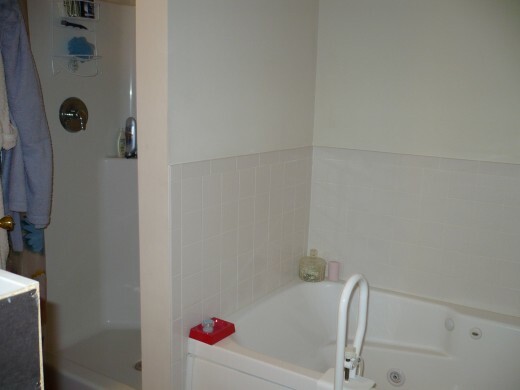 You can see from the photos that this bathroom is drab. It was also hard to photograph because it is 9 feet x 8 feet, with the walk in shower(behind the entry door) and whirlpool bathtub taking up most of the floor space on the left hand side. This bathroom also has double sinks on the right hand side with a huge mirror to enhance the actual size of the room. There were no throw carpets and a clear shower curtain that added to the boredom of this space. There are great amenities but no pizzazz. 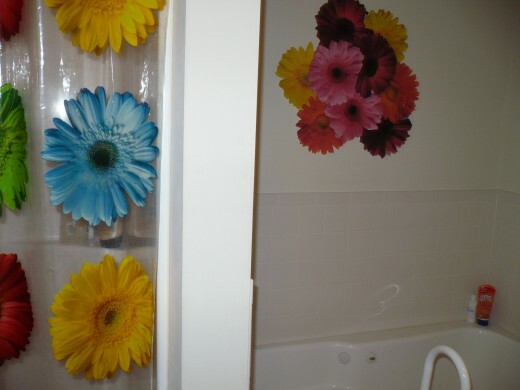 The shower curtain I purchased was clear with huge colored flowers on it. I don't like to feel closed in when I shower so the print on clear works for me. I choose big flowers and red shag carpets because I love the old retro look of the 1970s. The carpet in the bedroom is also red so I wanted to follow into the bathroom with the same color. The shower curtain was $10.00. The shag carpets were $14.95 each on sale from $19.95. I needed 2 carpets 5 feet x 3 feet 4 inches. These two carpets were bound on the edges so they won't unravel. The first carpet in front of the toilet fit nicely in place lengthwise without cutting it. The second carpet I turned and cut six inches off of the length of it, that, fit nicely in the hole above the other carpet in front of the sink. I used carpet seaming tape to joint all the carpet pieces together so they wouldn't shift when you walked on them. I added red baskets to hold the things we use everyday along with other red accessories and a pink towel set I already owned that looks great. I would like red towels so maybe in the future that will happen. TIP: If the seam between the two carpets bothers you, buy a throw rug to cover it. 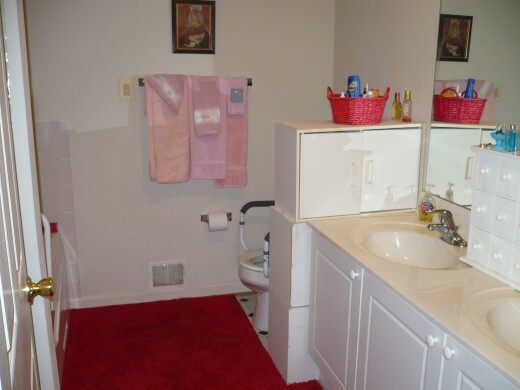 Putting red accessories around the bathroom gives the impression the bathroom is red without painting the bathroom red. How do we do Pizzazz? 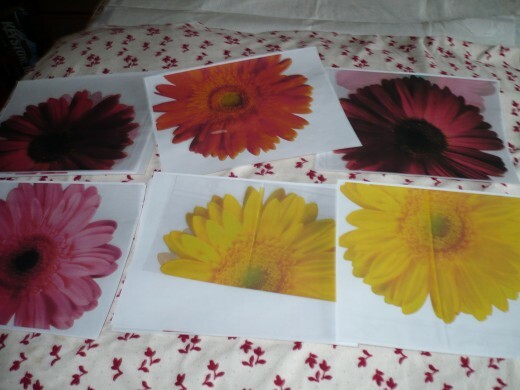 Take your bathroom shower curtain and copy the flowers with your copy machine. It doesn't matter if the whole flower copies or not. scotch tape them to the wall to form a pattern you like. You can fasten them on wall with wallpaper paste or a paste you make with flour and water. TIP: I just used scotch tape so they can easily be remove to change the pattern if I wished. 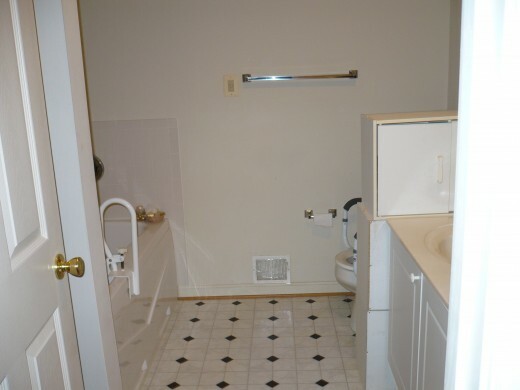 This bathroom was hard to photograph to see the whole room but I think you will get the drift of this decorating idea. You could even cover an entire wall this way or have fish or seashells floating around the ceiling with a seascape shower curtain. 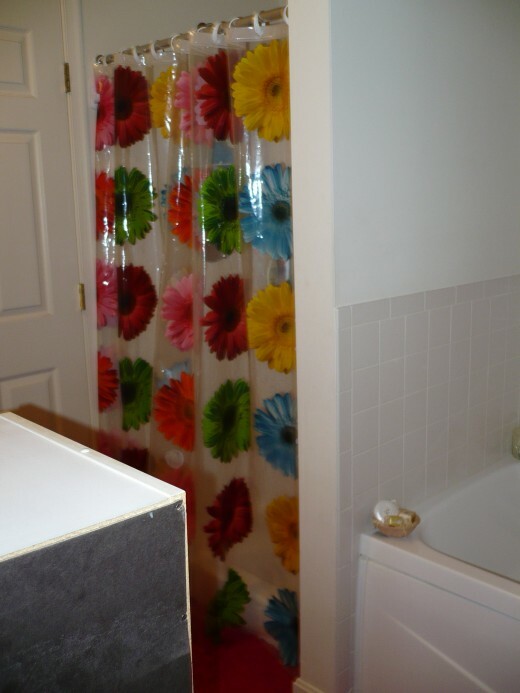 You can have fun with any pattern shower curtain you have. Thank you for reading and have a great day! Awesome easy decorating to do. I will be reviewing the Garrison oil filled Heater, White Westinghouse Fan Heater, and Vermillion Electric Fireplace She uses all these heaters to heat her rooms and save money in her home. 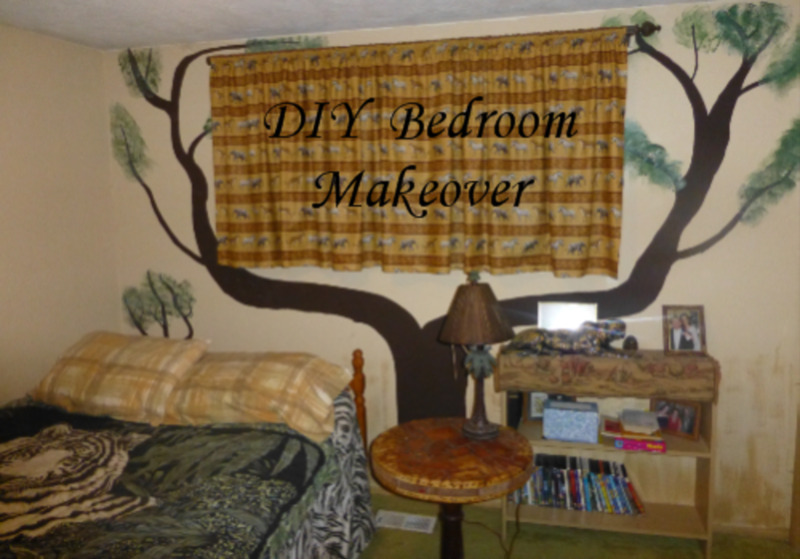 Do it yourself projects ,in your home, saves you money and stamps your personality into your finished masterpieces. These projects are affordable, easy and the end results will amaze your friends. @ rebeccamealey it was easy and it only cost 50$. 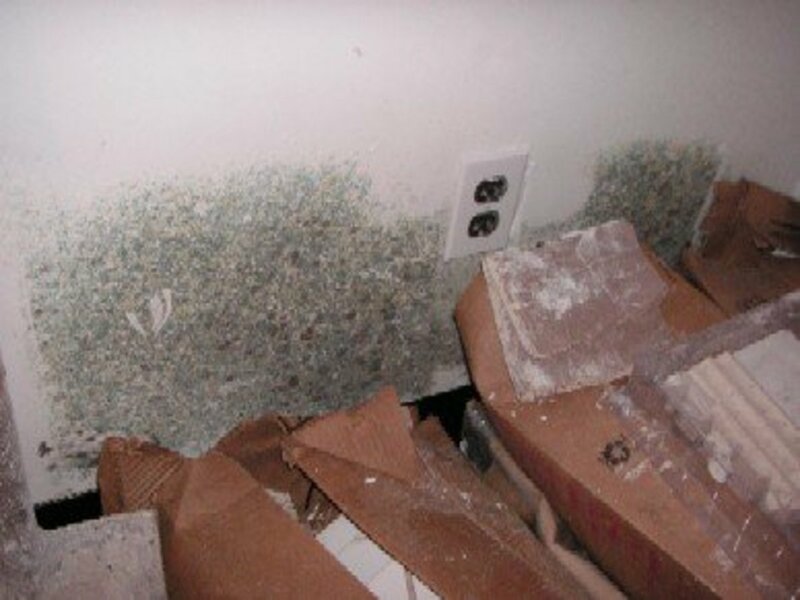 It could be cheaper if you bought the carpet as a remnant in stead of the carpets I used. Thanks a lot for your comment. @Thank you thumbi7. I appreciate the votes and sharing a lot. I loved your ideas and the way you have decorated your bathroom. 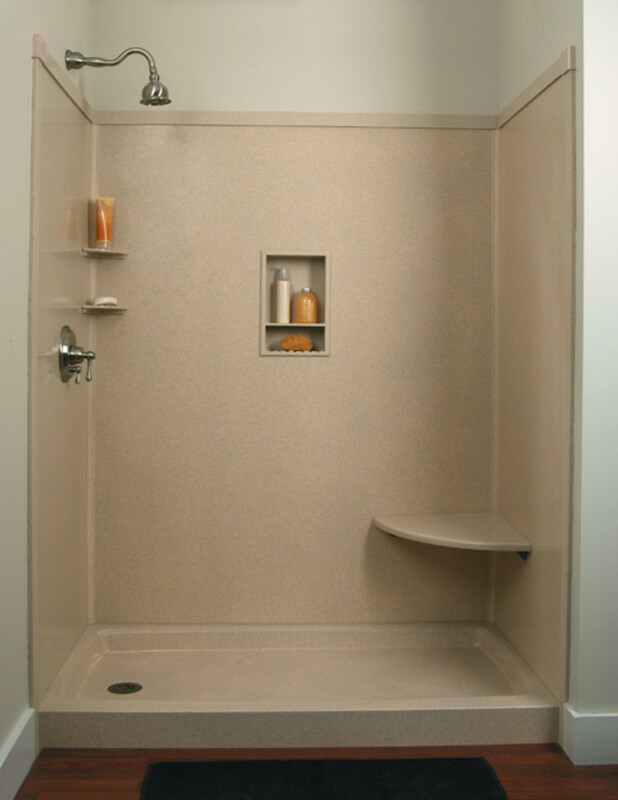 What a great looking bathroom makeover, and it looks really easy and cost friendly. Voted way up and shared! Thankyou Elias Zanetti. Putting a bold color in a small space makes it look much bigger. Thank you also for the follow. Have a great day my new friend. Great tips, Suzzy and the cost is really low. I think me bathroom needs a little bit of colour. I have been away also but now I am back and happy to be back. Thanks a lot for your comment b.Malin and welcome back my friend. I appreciate your input. I've been away, but now I'm back! Very Interesting Hub. We too had bathroom mirrors at least that size. That had some black edges too, so we bought Wood and Framed them and then painted the wood white. It looked great and solved our problem. It's amazing what we can do on our own. Thanks for sharing your Excellent ideas. Thank you livelifeworryfree. I enjoyed your comment that you need me on speed dial. I loved that and never heard of it before. I would love to hear about your next decorating adventure and always happy to help. Have fun and don't sweat the small things and it will turn out just fine. Thank you Always exploring. I love red also. Have a great day. Spring has sprung so enjoy your birdies. Thank you ceresSchwarz. Sometimes when we are the ones doing the project we get too picky about things when in reality no one but me notices. I need to not sweat the small stuff and thanks again for the compliment. 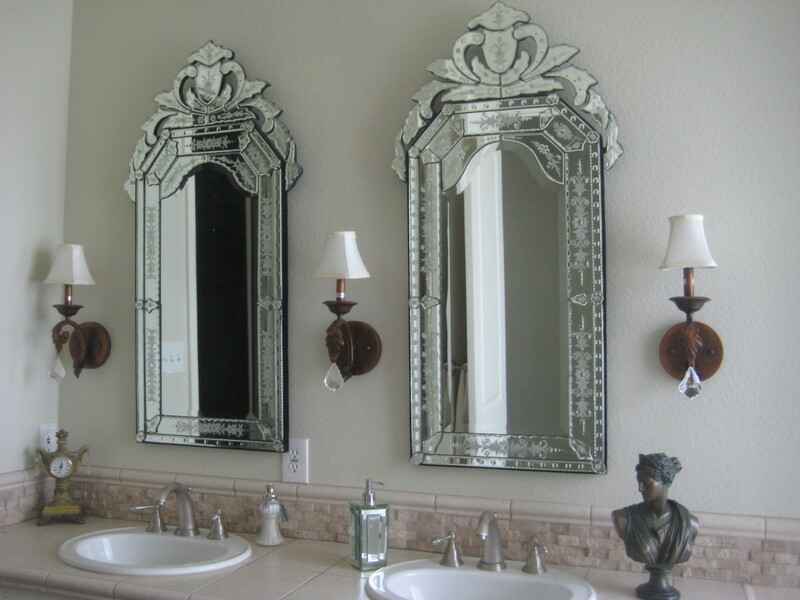 The images you have are lovely and do show what you're talking about on how to give a bathroom a makeover. 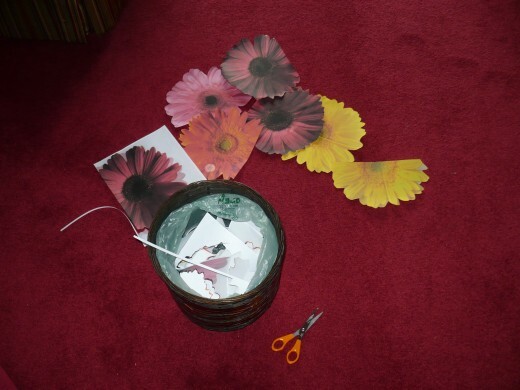 Great idea on photocopying the flowers on the curtain and then combining the flowers together and taping them on the wall. That is an easy way to really give a bathroom a makeover. I love that design on a penny. Thank you so much Faith Reaper for dropping in to visit. Excellent ideas. You are talking my language now! On HGTV, they used to have a show "Design on a Dime," and I would always tell my family I am "Designing on a Penny!" Thank you so much Carol. I always appreciate your input on my decorating as I know what an expert on decorating and craft person you are your self. You are soo clever and how you created a livable and charming room on few dollars. It looks so inviting. Voting up and sharing. Thanks a lot Kathryn. Sometimes I come up with some great ideas. It was a way to tie everything together with the same theme of a focal point. This has some good tips in it! 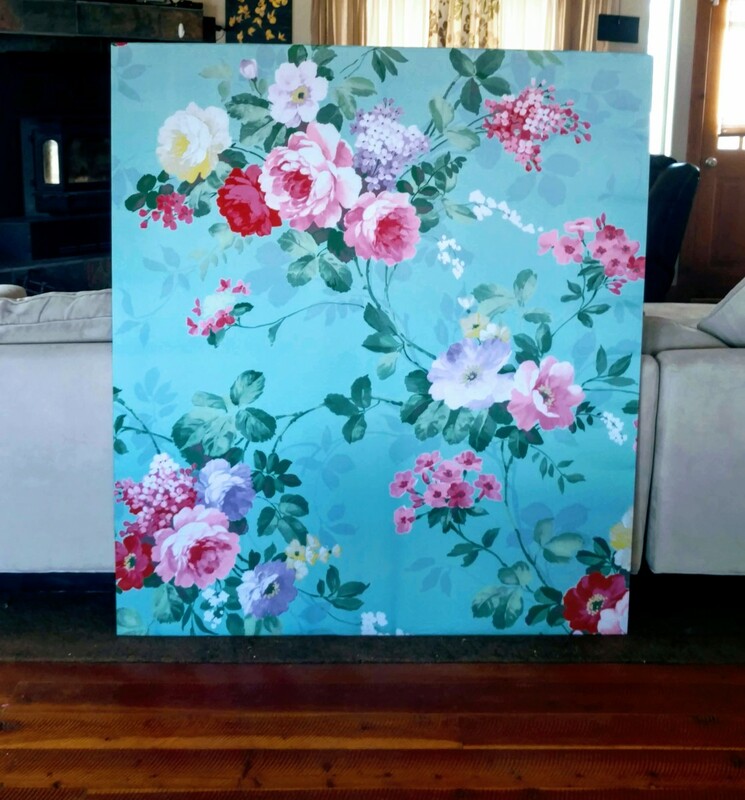 I love your idea of photocopying designs from a shower curtain to create a coordinated design. Clever idea! Thank you ChitrangadaSharan. It was fun to do. 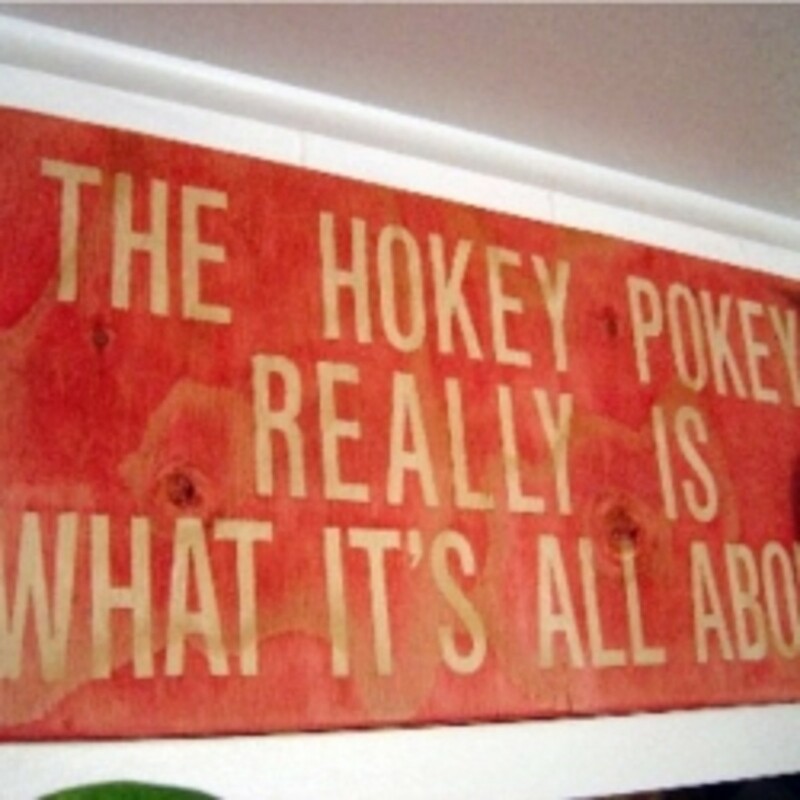 I love to do projects around the home. I appreciate your comments and have a wonderful weekend with your family. Interesting hub about bathroom makeover. It must be fun to do it with the lovely and vibrant flowers--very nice indeed!